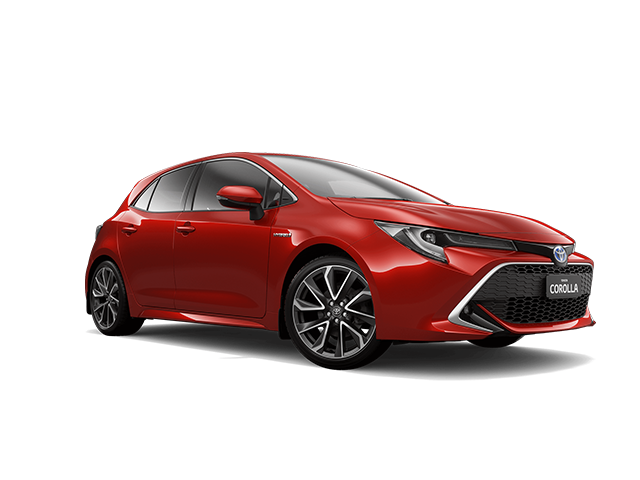 The new corolla hatch is the kind of hatchback that performs with power but travels light, is obsessed with style and engages all your senses. Designed to perfection, the front of the Corolla Hatch makes first impressions count, with a formidable bold shape that accentuates its agility and groundedness. An athletic stance adds to the vehicle’s aerodynamic efficiency and sleek shape. The upper grille and headlamps are connected in a thin single–stroke shape along the hood of the engine for a sporty feel, and together with the trapezoid under-grille, they enhance the three-dimensional design. Maximum effort has gone into creating a more spacious interior with a feeling of openness. The cabin has been meticulously crafted to emphasise this, but not without fastidious attention to detail. The spaciousness is continued through smarter instrument panel design with an enhanced tactile feel on the surface panel upholstery and stitching, while the console’s integrated functional components create more storage space and a sleeker aesthetic. The new seat design elevates drive comfort to the next level. Super sporty front seats come with electronic 2-way driver lumbar* support and shoulder support overlaps with solid, thick side bolsters for excellent holding performance. The back of the driver’s seat is slimmer to allow rear occupants more legroom, while the rear seat area has also been maximised, and has a 60/40 split for adaptable passenger/luggage configuration. The XR model has seat heaters on the driver and front passenger seats, which are fitted with a combination of leather and suede. An assertive mesh grille adds another trapezoid-shape that flows towards the headlamps. The voluminous fender top surface and sharp character line express sensual dynamism. Silver metallic 16-inch alloy wheels with a twin-spoke shape add an extra bit of attitude and emphasize the sportiness of the new design. The new Corolla Hatch is powered by a superb 1.2-litre turbocharged engine, featuring a host of efficiency-boosting technologies. This responsive petrol engine delivers 85 kW of power at 5200 – 5600 r/min and torque of 185 Nm at 1500 – 4000 r/min, offering a relaxed and rewarding drive, with maximum output for minimal effort and less changing of gears. Intelligent Manual Transmission on the 1.2T XS model ensures smooth shift operations for stress-free driving so that you can focus on what lies ahead. It also automatically adjusts engine revolutions when changing gears to ensure smoother, jolt-free shifting during up- or-downshifts - just like its name promises. Automatic Continuously Variable Transmission is available in the XS or XR variants, providing a 10-speed highly responsive Sequential Shiftmatic system that delivers a manual-like gear shift feeling. This gearless belt-driven transmission offers a theoretical infinite number of virtual gear ratios, seamlessly operating in the background, optimised for maximum fuel efficiency and driver comfort. All you have to do is accelerate, brake, steer and enjoy. *IMAGES USED ARE FOR DISPLAY PURPOSES ONLY AND MAY NOT SHOW EXACT VEHICLE SPECIFICATION. PLEASE CHECK WITH YOUR SALESMEN WHEN ENQUIRING. Terms and Conditions Apply.